The boat ploughed its way across rough seas under a sky the colour of bruises as if another storm was brewing. 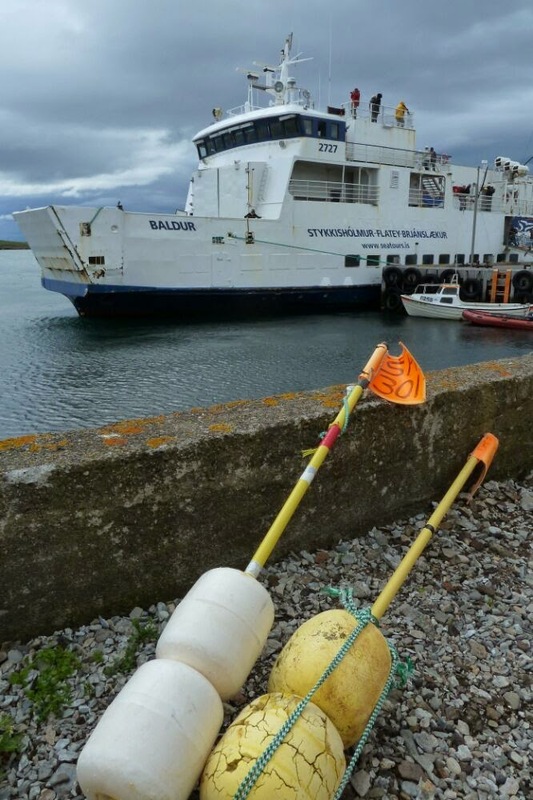 It picked a way through rocky skerries and tiny islets accompanied by seabirds that hung around at eye-level with any passengers who braved the outer decks in the bitter cold. After an hour there appeared on the horizon a small, green flat island with a single row of brightly-painted houses. The boat was the ferry Baldur that crosses Breidafjordur, linking the West Fjords and the Snaefellsness Peninsula. The island was Flatey, once the cultural centre of old Iceland when the coastal communities around Breidafjordur were the wealthiest in the country, courtesy of the sea's rich, natural bounty. Today Flatey is a small community of five permanent residents and lots of puffins. 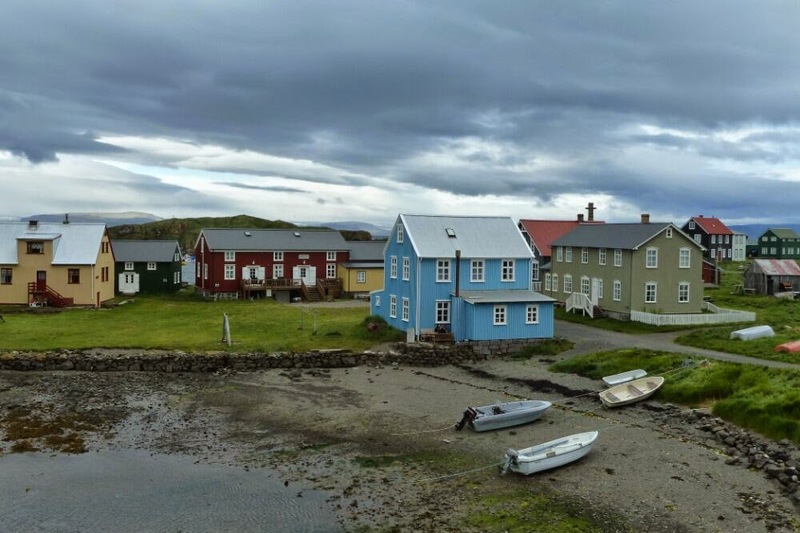 It's also the best preserved traditional village in Iceland. I was happy to fill a few hours here wandering the single dirt track that is the village street and watching the puffins while I waited for the last remnants of the storm to clear. When the Baldur made its second pass of the day, I jumped back on and continued to the Snaefellsness Peninsula which is described in visitor literature as "Iceland in a nutshell". It has coastal fishing villages, lava fields, dramatic peaks, sweeping beaches and a glacier. What more can you ask for! It also had some super cycling as I whizzed east along its south side on a flat, quiet road with a gentle tailwind. 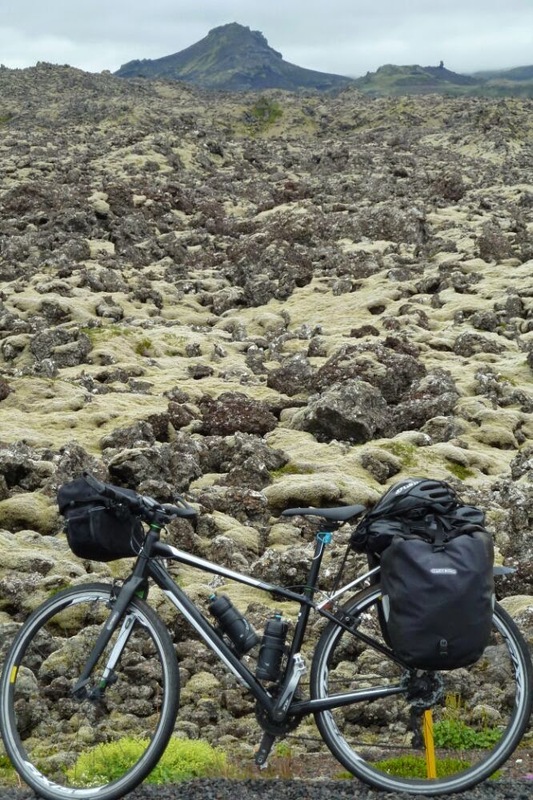 Given that cycling in Iceland has been quite challenging, I thought it was time for a few nice treats so I was whizzing towards Iceland's southwest corner which promised just that. The first of these treats was Pingvellir National Park, probably the most significant place of Iceland's past and its future. It was here that the Vikings formed the world's first ever democratic parliament in AD930. And it's here that the North American and Eurasian tectonic plates are separating, slowly pulling Iceland apart by 2cm every year. 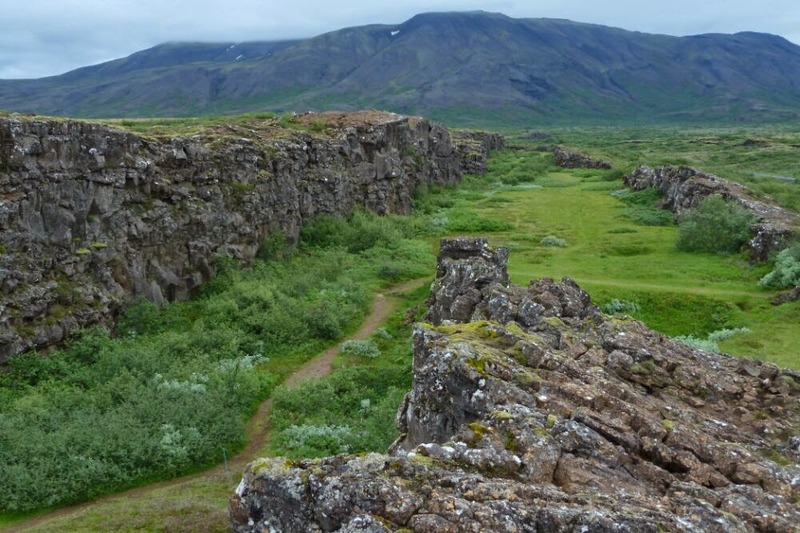 In Pingvellir this action has created a dramatic rift valley that cuts through the landscape. I pitched the tent, parked the bicycle and went for a walk along the northern part of the rift valley. Unlike the more southerly part in the park which has been developped for visitors, this section is raw nature and on a quiet, drizzly, clagged-in afternoon it had an eerie beauty. 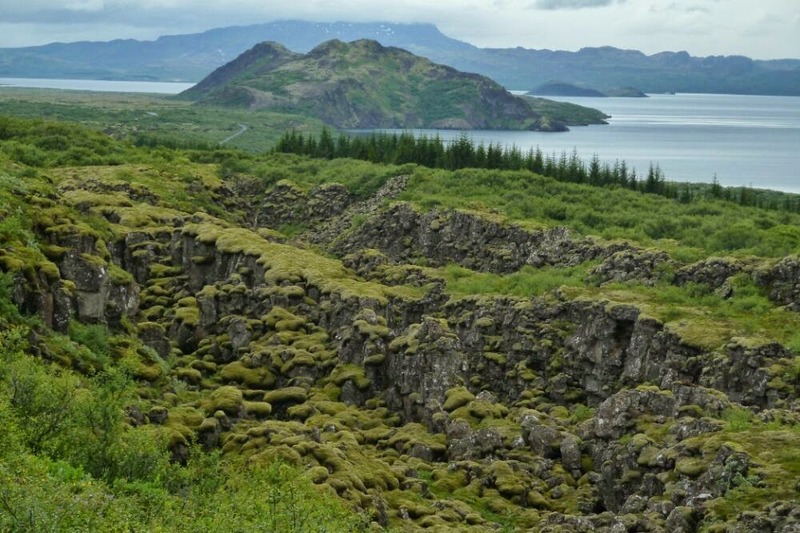 At the heart of Pingvellir is Iceland's biggest lake, Pingvallavatn. I cycled on through the park in the early morning on a quiet back road that climbed high above its grey waters. Lush, green forests of dwarf birch trees stretched to the horizon and on the empty road in mist and rain the whole place had a primeval atmosphere. Beyond Pingvellir was my second nice treat, the Geysir geothermal hotspot. The oldest geysir here, called Geysir, claims to be the one after which all other geysirs are named. It doesn't erupt anymore but sits quietly smouldering in a landscape of rolling green hills. 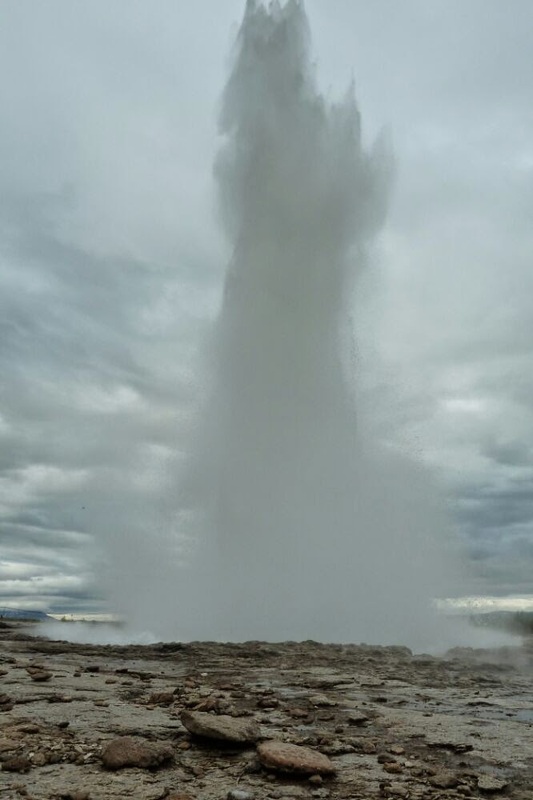 It's lucky then that its near neighbour, Strokkur, erupts spectacularly every ten minutes or so, sending boiling water 20 metres into the air. It's surrounded by lots of mini geysirs and boiling, bubbling, steaming pools of water so that walking through the area is like being in a giant, outdoor sauna. The campsite I'm staying in is so close to the hotspot that I can hear the rumblings and explosions during the night. It's amazing then that you have to pay extra for a hot shower that's only luke warm. Ahead are my last few days of cycling here. It's currently wet and windy, but hopefully the weather will turn nice in Iceland. 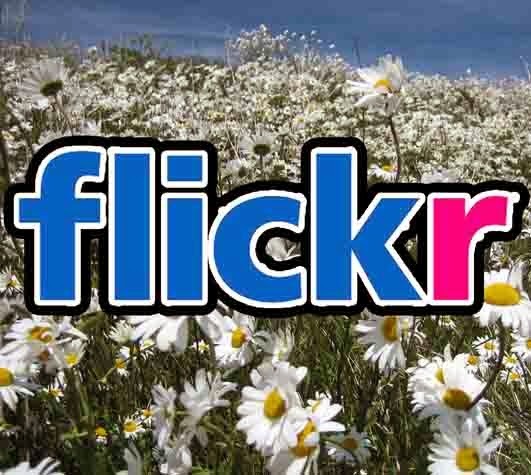 All the photos on flickr - click on the link. Route - ferry Baldur runs twice per day between the north shore of Breidafjordur at Bjarnslaekur and Stykkisholmur on the Snaefellsness Peninsula, calling at Flatey. 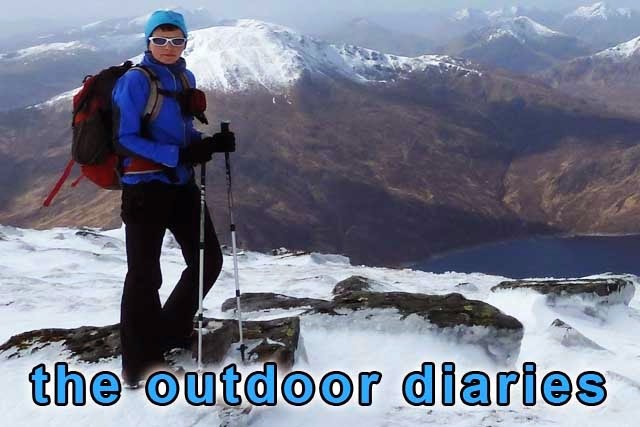 I cycled west along the north coast of the peninsula through small fishing villages then back east along the south shore and then down to Borgarnes. 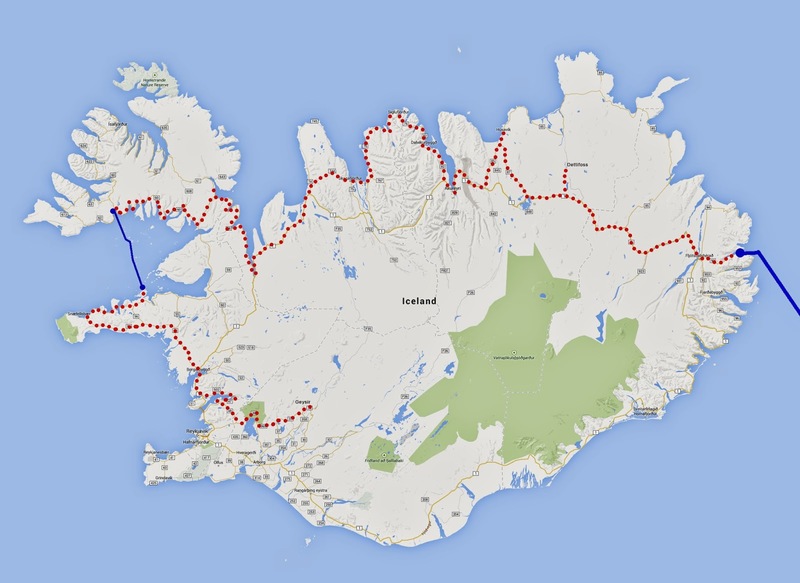 Cycled a short section of highway 1 which I did early morning as traffic in this part of Iceland is now quite heavy. Then took a gorgeous quiet road around Hvalfjordur which cyclists must take to avoid an undersea tunnel. Took dirt road 48 through a beautiful valley and mountain pass then picked up the road to Pingvellir which was extremely unpleasant being very busy and very windy. There are lots of tourist buses from Reykjavik in this area and they don't give cyclists any space on the narrow roads. When I have to cycle a section of these busy roads now, I always try to have it done by early morning before the tourist traffic builds.